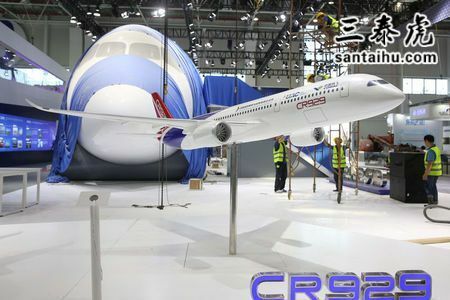 ZHUHAI, China (Reuters) - China and Russia on Tuesday unveiled a life-size model of a proposed wide-body long-haul jet at the opening of China's largest airshow, giving public shape to their joint efforts to break into a market dominated by Boeing and Airbus . The biennial Airshow China, being held in the coastal city of Zhuhai from Nov. 6-11, is traditionally an event for Beijing to parade its growing aviation prowess but comes as the country is dealing with a bruising trade war with the United States. The Commercial Aircraft Corporation of China and Russia's United Aircraft Corporation (UAC) showed off the model of the CR929's cockpit and passenger cabin in a ceremony that was attended by senior executives from both state-owned planemakers. "Our program is making progress and is on schedule," said UAC President Yury Slyusar. "It is currently in the preliminary design phase and we are also in the supplier and equipment selection phase, which will finish by the end of 2019." The mockup, which was 22 meters long, 6.5 meters tall and 5.9 meters wide, showed a roomy interior with 9-abreast basic seating in economy class. The cockpit contained dummy instruments, with actual systems yet to be chosen, including a sidestick similar to the flying control favored by Airbus over the traditional control column. "It is more Airbus than Boeing," a senior Western aerospace executive said. UAC and COMAC announced they would cooperate on a widebody jet program in 2014 and they kick-started full-scale development of the program three years later by forming joint venture China-Russia Commercial Aircraft International Corporation (CRAIC). To date, they have already sought proposals for the plane's engine and landing gear. Chen Yingchun, COMAC's chief designer for the CR929 program, told reporters that CRAIC would seek supplier proposals from all over the world but declined to comment on whether current trade frictions with the United States would influence their choice. The jet's designers have previously said its fuselage would be designed and made by China while the wings would be designed by Russia. Beijing wants the single-aisle aircraft to eventually compete with the Airbus A350 and the Boeing 787. A senior COMAC executive said in June that the CR929 aims to make its maiden flight from 2023. This will be fun! Name the first country that will allow the use of these planes other than Russia and China. Fly Boeing jets! The finest in the world. Based on my success with Chinese made products, I'll stick with Boeing or Airbus..thank you! Reverse engineering, Easier to copy Airbus technology. Is there a typo? the article says 9 across seating with a single aisle? China and Russia on Tuesday unveiled a life-size model of a proposed wide-body long-haul jet at the opening of China's largest airshow...it will be called Coffin. Russia has made great planes. US depended for years to send our astronauts to the international space station. Even Boeing has design center in Moscow. Don't under estimate them. China won't be buying Boeing jets in the future.